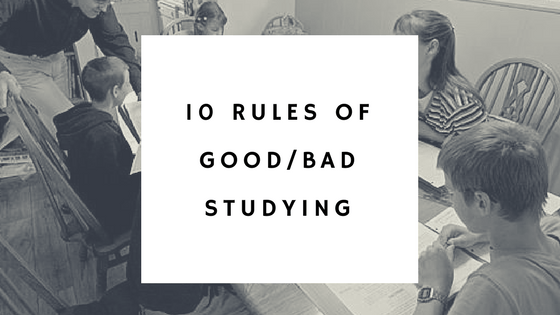 Everyone is busy especially parents with kids… And, we do not want to bother you with unworthy contents so we summarised contents into 10 Rules of Good and Bad Studying Habits. You would want to try to avoid those Bad Studying Habit and encourage those Good Studying Habits at all cost. Avoid these by all means necessary. These can waste your child’s time even while they fool your child into thinking he or she is learning! Does your child sit passively and run his eyes back over a page? Unless he can prove that the material is moving into his brain by recalling the main ideas without looking at the page, rereading is a waste of time. Letting highlights overwhelm your child. Highlighting text can fool your child’s mind into thinking he is putting something in his brain, when all he is really doing is moving his hand. A little highlighting here and there is okay – sometimes it can be helpful in flagging important points. But if your child is using highlighting as a memory tool, make sure that what he marks is also going into his brain. Merely glancing at a problem’s solution and thinking your child knows how to do it. This is one of the worst errors students make while studying. Your child needs to solve a problem step-by-step, without looking at the solution. Then, he is surely understand how to solve the problem. Wait until the last minute to study. Does your child usually cram at the last minute if he was practicing for a track meet? Your child’s brain is like a muscle – it can handle only a limited amount of exercise on one subject at a time. Repeatedly solving problems of the same type that your child already know how to solve. If your child just sit around solving similar problems during his practice, he is not actually preparing for a test – it’s like preparing for a big baseball game by just practicing his swing. Letting study sessions with friends turn into chat sessions. Checking problem solving with friends, and quizzing one another on what your child knows, can make learning more enjoyable, expose flaws in his thinking, and deepen his learning. But if he joint study sessions turns to fun before the work is done, he is wasting his time and should find another study group. Neglecting to read the textbook before your child starts working problems. The textbook is your child’s instructor – it guides him toward the answers. He will flounder and waste his time if he doesn’t bother to read it. Before he begins to read, however, take a quick glance over the chapter or session to get a sense of what it’s about. Not checking with teacher, parents or classmates to clear up points of confusion. Teachers are used to lost students coming in for guidance – it’s their job to help you. The students teachers worry about are the one who don’t come in. Don’t be one of those students. Thinking your child can learn deeply when he is being constantly distracted. Every tiny pull toward an instant message or conversation means he has less brain power to devote to learning. Every tug of interrupted attention pulls out tidy neural roots before they can grow. Okay, we have covered what your child should not do during studying… Then what does he/she needs to do then? Here are 10 Rules of Good studying that your child should do to drastically improve his learning and scores. After your read a page, he looks away and recall the main ideas. Highlight very little, and never highlight anything he hasn’t put in his mind first by recalling. Try recalling main ideas when he is walking to class or homeschool room from where he originally learned it. An ability to recall – to generate the ideas from inside oneself – is one of the key indicators of good learning. On everything. All the time. Flash cards are your child’s friend. Chunking is understanding and practicing with a problem solution so that it can all come to mind in a flash. After your child solves a problem, rehearse it. Make sure he can solve it cold –every step. Pretend it’s a song and learn to play it over and over again in his mind, so the information combines into one smooth chunk he can pull up whenever he wants. Spread out your child’s learning in any subject a little every day, just like an athlete. Your child’s brain is like a muscle – it can handle only a limited amount of exercise on one subject at a time. Alternate different problem-solving techniques during practice. Never practice too long at any one session using only one problem-solving technique – after a while, your child is just mimicking what he did on the previous problem. Mix it up and work on different types of problems. This teaches your child both how and when to use a technique. (Books are generally are not set up this way, so you will need to do this on your own for your child). After every assignment and test, ask your child to go over his errors, make sure he understands why he made them, and then rework his solutions. Another way to do this is to randomly flip through book, pick out a problem, and see whether your child can solve it cold. To study most effectively, handwrite (don’t type) a problem on one side of a flash card and the solution on the other. (Handwriting builds stronger neural structures in memory than typing). It is common to be unable to solve problems or figure out concepts in math or science the first time your child encounters them. This is why a little study every day is much better than a lot of studying all at once. When your child gets frustrated with a math or science problem, ask him to take a break so that another part of his mind can take over and work in the background. Use explanatory questioning and simple analogies. Whenever your child is struggling with a concept, ask him to think, “How can I explain this so that a eight-year-old could understand it?” Using an analogy really helps, like saying that the flow of electricity is like the flow of water. Ask your child not just think explanation but say it out loud or put it in writing. The additional effort of speaking and writing allows your child to more deeply encode (that is, convert into neural memory structures) what he is learning. This can be an extreme method but really effective. Ask your child to turn off all interrupting beeps and alarms of cellphone and computer, and then turn on timer for twenty-five minutes. Focus intently for those twenty-five minutes and try to work as diligently as he can. After the timer goes off, give himself a small, fun reward. A few of these sessions in a day can really move your child’s studies forward. Try to set up times and places where studying – not glancing at computer or phone – is just something your child naturally do (e.g. local library). Do the hardest thing earliest in the day, when your child is fresh. This will help avoiding procrastination. Imagine where you have come from and contrast that with the dream of where your studies will take you. Post a picture or words in your workspace to remind you of your dream. Look at that when you find your motivation lagging. This work will pay off both for you and those you love! Okay, we now got the idea what takes good studying… And you might wonder… What is Step #3, Chunking really means? Do I just ask my child to go same problem over and over? Well, Yes and No. Let us delve into what really takes to build a Powerful Chunk that really help your child excel in Math and Science. When your child is learning new math and science materials, he is almost always given sample problems with worked-out solutions. This is because, when we are first trying to understand how to work a problem, we have a heavy cognitive load – so it helps to start out with a fully worked-through example. It is like using a GPS unit when we are driving on unfamiliar roads in the middle of the night. Most of the details in the worked-out solution are right there, and your child’s task is simply to figure out why the steps are taken the way they are. That can help your child see the key features and underlying principles of a problem. Keep in mind that we are not talking about a cookie-cutter “just do as we are told” mindless approach when following a worked-out solution. It is more like using a guide to help us when traveling to a new place. Pay attention to what’s going on around us when we are with the guide, and soon we will find ourselves able to get there on our own. We will even begin to figure out new ways of getting there that the guide didn’t show us. Ask your child to work a key problem all the way through on paper. (Your child should have the solution to this problem available, either because he has already worked it or because it is a solved problem from his book. But ask your child not to look at the solution unless he absolutely has to!). As your child works through this problem there should be no cheating, skipping steps, or saying, “Yeah, I’ve got it” before your child has fully worked it out. He needs to make sure each step makes sense. Ask your child to do another repetition of the problem, paying attention to the key processes. If it seems a little odd to work a problem again, remind your child that no one would learn to play a song on the guitar by playing it only once, or work out by lifting a weight a single time. Your child can study other aspects of the subject if he needs to, but then go do something different. Study a different subject, or go play his or her favorite sports. Your child needs to give his diffuse mode time to internalize the problem. Before your child goes to sleep, ask him to work the problem once more. Even if he gets stuck, it is okay. Work the problem briefly and go to bed. Let your child’s subconscious tell him what to do next. As soon as your child can the next day, work the problem again. He should see that he is able to solve the problem more quickly now. Your child’s understanding should be deeper. He may even wonder why he ever had any trouble with it. Ask him to keep his focus on the parts of the problem that are the most difficult for him. This continued focus on the hard stuff is called “deliberate practice”. Although it can sometimes be tiring, it is one of the most important aspects of productive studying. Ask your child to pick another key problem and begin working on it in the same way that he did the first problem. The solution to this problem will become the second chunk in his chunked library. Repeat steps one through five on this new problem. And after he becomes comfortable with that problem, move on to another. He will be surprised how even just a few solid chunks in his library can greatly enhance his mastery of the material and his ability to solve new problems efficiently. Ask your child to mentally review key problem steps in his mind while doing something active, such as walking to the library or exercising. He can also use spare minutes to review as he is waiting for a bus, sitting in the passenger seat of a car, or twiddling his thumbs until a teacher or you arrive in the homeschooling or school classroom. This type of active rehearsal helps strengthen your child’s ability to recall key ideas when he is solving homework problems or taking a test. That’s it. Those are the key steps to building a chunked library and excel in math & science class. Okay, now we understand how to help our children to excel in Math and Science but the last question is how to help our children to implement all these things. Buy a planner-journal so your child can easily track when he reaches his goals and observe what does and doesn’t work. Help your child to commit himself to certain routines and tasks each day to make it a habit. Ask your child to write his planned tasks out the night before, so his brain has time to dwell on his goals to help ensure success. Arrange your child’s work into a series of small challenges. Always make sure he gets lots of rewards. Help him to take a few minutes to savor the feelings of happiness and triumph. Deliberately delay your child’s rewards until he has finished a task. Help your child putting himself in new surroundings with few procrastination cues, such as the quiet section of a library. Help your child to gain trust in his new study system. Your child works hard during times of focused concentration – and also trust his study system enough that when it comes times to relax, he actually relax without feelings of guilt or worry. “Eat your frogs first.” Do the hardest thing earliest in the day, when he is fresh. This will help avoiding procrastination. This article contains a lot to take in and we sincere hope you gain insights and help your child excel in Math & Science. Please do share how it goes with your child.